Johnny was no newcomer to TV when he starred in The Rifleman. As an actor, Johnny Crawford has appeared in over 250 television productions, 15 movies, and 12 plays. In 1959, Johnny & his brother Bobby were both nominated for Best Single Performance on the 11th Primetime Emmy Awards and their father Robert, Sr., were all nominated for Emmy Awards (the brothers for acting and their father for film editing). Johnny for his recurring portrayal of Mark McCain, son of Lucas McCain, on The Rifleman and Bobby for CBS anthology series Playhouse 90/Child of Our Time. Johnny didn't win, do you know who won? Besides "The Rifleman", Johnny has starred with Chuck in several different things. Branded ~ Paradise ~ The Gambler Returns: The Luck of the Draw ~ All American Cowboy. Can't forget, When the West Was Fun. He was a Mouseketeer on The Mickey Mouse Club. 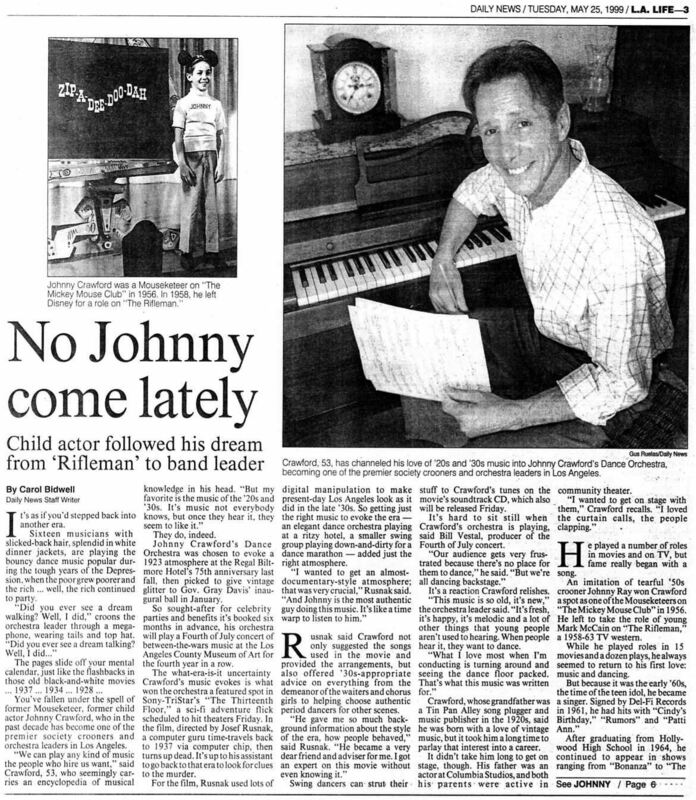 Johnny began entertaining at age 4. One year later he became one of the Original Mouseketeers. 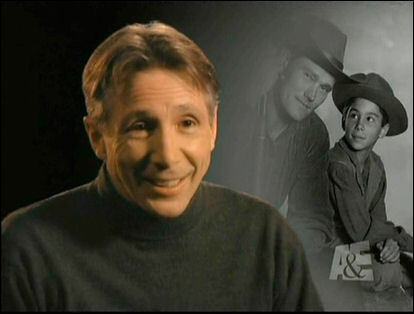 In a 1995 interview with David Fury, Johnny Crawford recalled some of his memories of working with Chuck on "The Rifleman." As a child, Johnny was a huge fan of westerns, and being cast as Mark McCain was a dream come true for the young actor. Johnny's interview for the role was at the Hal Roach Studios in Culver City, and he initially read for the producers. Johnny met Chuck Connors on his second interview, and then later was told he got the job—he was elated! Chuck knew right a ways that he was the one he wanted. the part of Mark McCain. Taken from the book - Chuck Connors....."The Man Behind the Rifle" - "When Johnny Crawford came on the set in 1958—he was a little twelve-year-old boy―he called everyone in the cast or crew, sir or ma'am. During the course of the five years of our run, he had two hit records, and he was nominated for an Emmy for Best Supporting Actor. And yet, when the show was finished after five seasons, Johnny went around and thanked everyone in the cast and crew, and he still called them sir or ma'am. ♫ Signed by Del-Fi Records in 1961, Johnny had five hits in the 1960s: Cindy's Birthday, Rumors, Your Nose Is Gonna Grow, Proud, and Patti Ann. D uring the same period he also had four albums in the top 40. A collection of his Del-Fi recordings from the 1960s, is available on CD (The Best of Johnny Crawford). On the 15th anniversary of the Festival of the West, Johnny Crawford was presented with the Cowboy Spirit Award! Along with Mickey Rooney, Rick Schroder and Peter Brown. Congratulations Johnny aka Mark McCain! *Did you know that Johnny Crawford received an Emmy Nomination at the age of 13 for "Best Supporting Actor" in a Drama Series for his role in The Rifleman? Johnny didn't win; I'll tell you he would have had my vote! Do you know who won? It is great! If you don't have this you don't know what you are missing! Edited version of the 1997 book, with lots of new photos, and also a complete Rifleman episode/plot synopsis guide.